Call SERVPRO of Tracy at 209 834 0200 for any kind of water, storm or fire damage. A downspout is an essential part of your gutter system and many problems can occur if it's not functioning properly. As you start to plant your spring flowers, be sure to check around the foundation of your home for pooling water. If you find water in your basement or crawlspace, we at SERVPRO of Tracy is here to help you out. Check for pooling water and drainage issues near downspouts and gutters which can cause flooding and foundation problems. As a locally owned and operated company, since 2006, providing the best possible customer service is our business. We appreciate you taking the time to contact us at 209 834 0200. Selling your home can be an overwhelming experience as you coordinate between realtors, inspections and potential buyers. SERVPRO of Tracy is happy to help clean your house and get it ready for showings and its sale. With our highly trained crews we are prepared to help with any cleaning task ranging from mold remediation to deodorization to general cleaning services. We have helped many homeowners prepare and sell their homes with a top to bottom cleaning. Our thorough cleaning services can include wiping ceilings and walls, trim, the exterior of baseboard registers, and cleaning the inside and outside of kitchen and bathroom appliances. Window cleaning and floor cleaning are a great way to finish the project up and add the final sparkle to your fresh home. When Storms or Floods hits, SERVPRO is Ready! SERVPRO of Tracy specializes in storm and flood damage restoration. Our crews are highly trained and we use specialized equipment to restore your property to its pre-storm/flood condition. When storms hit the Westcoast area we can scale our resources to handle a large storm or flooding disaster. We can access equipment and personnel from a network of 1,650 Franchises across the country and elite Disaster Recovery Teams that are strategically located throughout the United States. TIPS on What to do Until HELP ARRIVES? Emergency Tips For Your Home or Office..
Commercial Damage on a Monday Morning? No one wants to discover water or fire on a Monday morning. Unfortunately, a commercial facility is more likely to have a larger, more significant damage than a residential home. This is not only because of the facility's size, but it is also because commercial facilities generally have longer periods without anyone there (i.e. overnight, weekends, holidays). Because of this, it is important to have a plan in place in case a disaster does happen. When purchasing homeowners insurance, there are many factors to consider, especially what would happen in the case that you experience storm damage. If you live in an area that is prone to severe storms, it is even more important to understand the kind of insurance policy you have, the limitations of it, what it covers and the kinds of storms for which you might not be covered. A lot of homeowners have experienced a bad hailstorm already or seen the storm damage which hail can cause to automobiles, homes, businesses and other property. When hail hits, it does the most damage to the outside of your property or home. Types of damage that are commonly caused by hail include siding damage, roof damage, window damage, shingle damage and automobile damage. Most homeowners standard policies, known as HO-3 policies, will cover your home and its contents. Usually you are covered against theft, storm damage, some major disasters like hurricanes, tornadoes and hail, plus pet damage. Floods and earthquakes are not usually covered under a majority of standard insurance policies and need a separate policy. Home insurance policies, remember, don’t cover normal wear and tear or poor maintenance, so you should ensure that your home is properly maintained at all times. When you are in the market for a homeowner’s policy, it is a good idea to look at several different companies first. Different companies for insurance will offer a significant range of coverage levels, prices, and discounts. Don’t just shop the ones you know best, but look for the policy which works for your situation the best. If you find a policy which looks good but is offered by a company you don’t know, it is helpful to look into their background. Ensure that the insurance policy you select will cover adequately the natural disasters and storms in your area. Look out for insurance companies that are known for denying claims unfairly. Each year, the American Justice Association publishes a list of the ten worst companies. If your insurance company is found on this list and your claim for insurance has been denied, ensure you connect with a contract that is reputable, such as SERVPRO of Tracy, who has the experience to be able to fight for what you deserve. If you do experience storm damage of any kind, make sure to contact our professional technicians at SERVPRO of Tracy by calling 209-834-0200 right away so we can assess your damages and make sure that you get the compensation you deserve. Call SERVPRO OF TRACY on 209-834-0200 for any kinds of water or fire needs at your business/home. Ice makers are a great convenience item to have in your home. You do not ever have to worry about those annoying ice trays again, or someone not refilling them and you running out of ice. When you add this device in your home, you need to be aware of some things first. The installer should use a small metal saddle, called an ice maker valve, that is attached to a cold-water pipe close to the refrigerator. The kits for ice-makers usually include a clear plastic water pipe fitted to the valve and the water inlet on the fridge. This flexible piece of plastic tubing is the biggest culprit for a leak and water damage. Miniscule holes in the tubing are unnoticeable during installation in your kitchen, and stay unnoticed for years, hidden behind your refrigerator. Over time, many gallons of water seeping out the tubing can cause serious structural water damage to the floors and walls around your refrigerator. This water damage means you need professional help from SERVPRO of Tracy, a water damage remediation company. Our experienced technicians have the tools and the knowledge to fix any water damage these types of leaks can cause. SERVPRO of Tracy specializes in the cleanup and restoration of residential and commercial property after a fire, smoke or water damage event. Our staff are highly trained in property damage restoration. From initial and ongoing training at SERVPRO corporate training facility to regular IICRC-industry certification, rest assured our staff is equipped with the knowledge to restore your property. SERVPRO of Tracy were called to this Commercial Dentist Office in Town during Christmas Holidays. In the event of a burst pipe or flood? Firstly if possible and safe to do so turn off the water supply line to prevent further water entering the premises, but be aware that with water damage comes other safety risks such as electrical items being in contact with water, if in doubt stay out. You don’t want to lose business due to restoration work, however, delaying the work or doing this yourself improperly could mean you lose a lot more time and money for your business in the long run. While hiring SERVPRO of Tracy, cleanup and restoration team may seem costly it will save you money in the long run. If the primary damage is mitigated quickly and properly, then secondary damage cannot occur and this will save you money down the line as secondary water damage is more costly to repair both in terms of the cost of the repairs and the time it will take to complete the restoration which may prevent you from conducting business at the property. In this picture toilet water supply line broke, causing water flooded in entire Dentist Office during the Christmas Holidays. SERVPRO of Tracy extracted water vapor from the air, dehumidifiers lowered the relative humidity, which in turn increases the rate of evaporation. In a water damaged structure, dehumidifier pull in the moist humid air and than discharge dry, warm air. The owner was very happy that SERVPRO of Tracy did a very good job and his business is back to normal in no time. Restoring Commercial Property after a Water Damage..
We, at SERVPRO of Tracy specialize in flooding and water damage events in commercial properties are often complex with numerous issues that require a knowledgeable and flexible response. Whether we’re dealing with a relatively small water cleanup scenario or a large scale event, we work quickly to assess each unique situation and isolate the damaged area. In many instances, normal operations can continue in a temporary space while we restore your facility. Our professional technicians are trained to be mindful of legal and environmental concerns and strive to fully restore the damaged area while working within your budgetary constraints. We understand that every hour spent cleaning up is an hour of lost revenue and productivity. 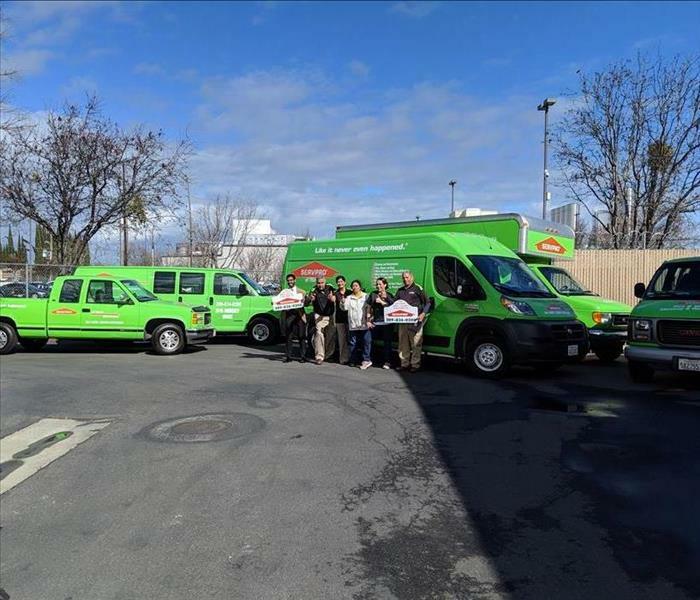 So when an emergency situation arises in your business, give us a call at SERVPRO of Tracy 209 834 0200 and we’ll be there fast with the help you need. SERVPRO of Tracy specializes in the clean-up and restoration of commercial and residential property after a water damage event. Our staff are highly trained in property damage restoration. From initial and ongoing training at SERVPRO corporate training facility to regular IICRC-industry certification, rest assured our staff are equipped with the knowledge to restore your property back to "Like it never even happened." Trust SERVPRO of Tracy Professionals to Remove Mold Damage and Prevent Future Growth. There are many misconceptions about mold, and it seems that most of the surrounding area of Tracy homeowners believe that fungal growth is something that is unlikely or improbable for their house. In all actuality, it is a straightforward process for mold to grow in your home, as it only really requires two elements to start colonizing: moisture and organic material. However, even with the ease of which mold damage can occur to your home, many homeowners are still misled to believe fungal growth is not a serious concern. In actuality, mold growth in your house is linked with potential health effects for you and your family when you are exposed, so correcting the issue when you see it should be a priority. Moreover, this is a concern that should get dealt with by certified mold remediation specialists, as they can safely remove the colonies from your home and help you to prevent recurrences in the future. From the moment that our SERVPRO of Tracy IICRC certified remediation professionals enter your home, an assessment begins to isolate the area where mold currently is growing as well as the source of the moisture that has been feeding the colonies to this point. Through isolating the affected area with negative air chambers and air scrubbers with HEPA filters, our technicians can successfully prevent the spread of spores to new areas of your home while we work to remove the colonies. Locating the source of the moisture that feeds this mold growth in your home is a critical component of the remediation process. Otherwise, the mold damage is likely to return again and again. In areas like your bathroom/basement, which is a common location for fungal growth in homes, the culprit is often cracks or vulnerable points in the block construction of the foundation walls that have weakened over time. Drying the area removes the food source for mold spores, and this process gets accomplished with dehumidification equipment and large air movers. 3/8/2019 - Are you Ready for April Showers? 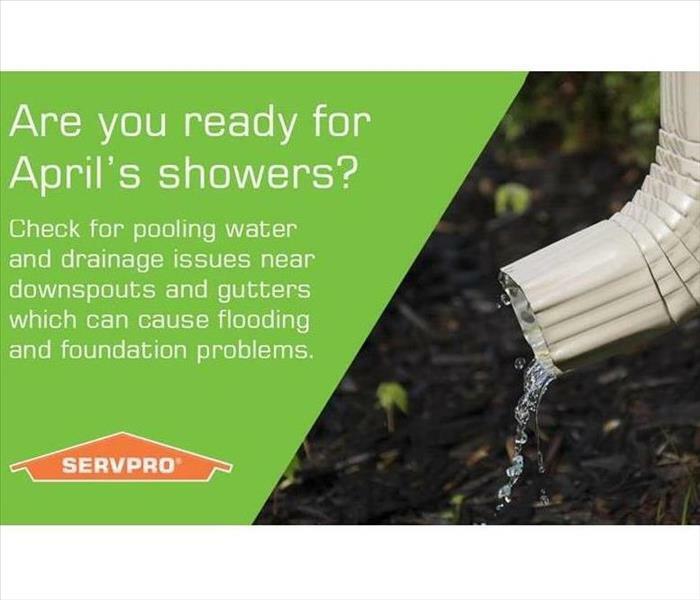 3/6/2019 - When Storms or Floods hits, SERVPRO is Ready! 3/1/2019 - TIPS on What to do Until HELP ARRIVES? 3/1/2019 - Commercial Damage on a Monday Morning? 12/19/2018 - Restoring Commercial Property after a Water Damage..